Comedy actor Ben Stiller is to be honoured with a special prize at next week's MTV Movie Awards in recognition of his contribution to Hollywood. The star of films such as Zoolander and There's Something About Mary will receive the MTV Generation Award, the ceremony's top honour. "Ben Stiller has kept fans rolling with laughter since bursting onto the scene in Reality Bites," said MTV. Stiller's latest movie Night at the Museum 2 was released on Wednesday. The Generation Award acknowledges an actor "who has captured the attention of the MTV audience throughout their career", said the channel in a statement. Actors to have previously been honoured in this way include Adam Sandler, Mike Myers, Tom Cruise and Jim Carrey. "I am honoured to be getting the Generation Award. 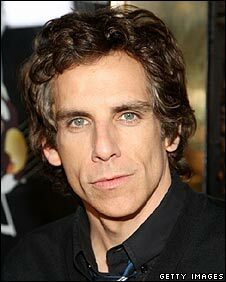 I was given my first show at MTV and also cancelled for the first time," said Stiller. Stiller has also been nominated in a new category at the awards which recognises a particularly hilarious and gruesome movie moment. The scene in question comes from the action movie spoof Tropic Thunder and involves the character played by Steve Coogan losing his head. High School Musical star Zac Efron will present Stiller with the Generation Award. The other guest presenters will include Shia Labeouf, Sandra Bullock, Sienna Miller, Denzel Washington and Cameron Diaz. Eminem will perform music from his new album Relapse and Kings of Leon will play their hit Use Somebody. The MTV Movie Awards will take place on Sunday 31 May at the Gibson Amphitheatre in Universal City, California.